Heading to BROSTOCK 2014 in the Ozarks? Extend your trip and head out to KC Watersports! _Brostock 2014 is at Lake of The Ozarks this year! As you all know, Brostock kicks off on June 4-5-6-7. Why not extend your trip and get some riding in! KC Watersports is hooking it up with double your ride time on Wednesday June 4th or Thursday June 5th!!! All you have to do is stop in and ride on Wednesday or Thursday. Say "Brostock" when you are checking in and we will give you 50% off your ride time for the day. This is good for a 2 hour, 4 hour or All Day pass! Since you'll be heading back on Sunday or Monday be sure to stop back by KCW! If you rode on Wednesday June 5th or Thursday June 6th at KCW......went to Brostock 2014......"PROVE IT" with a picture etc.....we will give you 1 FREE 2 HOUR PASS to use on Sunday June 8th or Monday June 9th! If you rode at KCW on Wednesday June 4th or Thursday June 5th, have proof that you were at Brostock 2014......PROVE IT......and get 1 Free 2 hour pass to use on Sunday June 9th or Monday June 10th! June 4-7 Liquid Force is Bringing the World's best wake event to Lake of The Ozarks! _The world's best wakeboard contest is back! 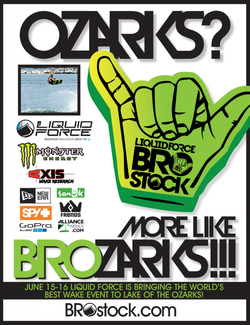 Liquid Force's world famous BROstock will be taking place June 4-7at scenic Lake of the Ozarks, Mo. Fueled by Monster Energy, BROstock will feature twenty five of the world's best riders including Harley Clifford, Shane Bonifay, and Bob Soven competing in a double-up contest for over $30,000. Axis Wake Research, the official towboat of BROstock, will be pulling the world’s best behind a new 2013 A22. Come and hang out with your favorite LF teamriders, pick up a pair of custom Spy Optic BROstock sunglasses, a LTD New Era BRO cap, make some new FRENDS, and have the time of your life. Come for the contest, stay for the party! BROstock’s 2014 partners include Monster Energy, Liquid Force, Axis Wake Research, Spy Optic, GoPro, Sanuk, New Era Cap, Frends, and Alliance Wakeboard Magazine.